Melatonin benefits more than sleep. For migraines, it can be an unexpected and effective treatment option. Melatonin has also been know to help treat jet lag, Alzheimer's, glaucoma, and tinnitus. The crushing pain, nausea, and light sensitivity of a migraine headache can wreak havoc on the lives of migraine sufferers. For many, the only treatment options are heavy-duty pharmaceuticals with many unpleasant side effects. And those don’t even work for everyone. But research is pointing to surprising melatonin benefits that may offer new hope to migraineurs. Melatonin, most commonly known as the sleep hormone, helps to control our circadian rhythm, the 24-hour cycle that tells our bodies when it is time to sleep. Although it’s primary function is biological timekeeping, researchers have found that it can also modulate and decrease pain, possibly playing an important a role in migraine prevention. Produced by the pineal gland, melatonin is at its lowest level during the light of day and steadily increases to a maximum level late at night. Researchers noted that many people have less pain at night—just when melatonin is peaking. They looked deeper and learned that melatonin acts on the receptors for many pain-relieving molecules in the brain (eg, opioid receptors), leading to a decrease in pain sensations when melatonin levels are high. 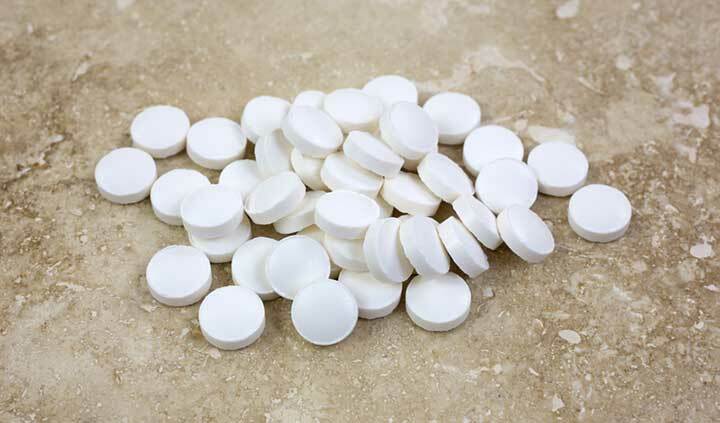 Melatonin supplements have been shown to lower pain intensity in conditions such as fibromyalgia, irritable bowel syndrome, and migraine headaches. Based on these findings, melatonin is being pursued as a possible therapeutic tool to prevent migraines. A clinical trial found that 3 mg of melatonin 30 minutes before bedtime helped to reduce the overall frequency, intensity, and duration of headaches for the subjects in the study. 25 out of the 32 participants saw a decrease in headache frequency of 50 percent, and eight participants saw a complete remission of headaches. This study also found menstrual migraines to be improved as well for the female subjects. Researchers also looked at the use of agomelatin, a melatonin receptor agonist (something that acts like melatonin in the brain), to treat migraines. They found that the intensity and duration of migraine attacks decreased with use of agomelatin, and overall depression and sleep disruptions improved as well. Although agomelatonin itself is not naturally occurring, these results add to the growing body of evidence of the promising melatonin benefits for migraine sufferers. To try using melatonin as a preventative migraine treatment at home, take it 30 to 60 minutes before sleep on a daily basis. The most promising studies show a dosage of 3 mg to be effective in reduce migraine symptoms. Along with helping you to fall and stay asleep, a melatonin supplement might just help relieve some of your pain and let you live more migraine-free days. Give it a try and tell us what you think. Do you suffer from migraine headaches or other painful conditions? Have you tried melatonin or other natural remedies? Have you experienced other melatonin benefits? What migraine remedies have you found to be the most effective? Please help our community by sharing your thoughts, questions, and experiences. You can comment below, visit us on Facebook or follow us on Twitter. Cephalalgia. 1995 Apr;15(2):136-9; discussion 79. Zh Nevrol Psikhiatr Im S S Korsakova. 2011;111(9):32-6.
add, bowel syndrome, brain, depression, depression and sleep, fibromyalgia, headaches, hormone, ibs, ibs, irritable bowel, irritable bowel syndrome, light sensitivity, melatonin, melatonin and migraines, melatonin benefits, melatonin for sleep, melatonin headache, menstrual cycle, migraine, migraine headache, migraine headaches, migraine remedies, migraine symptoms, migraine treatment, migraines, natural remedies, pain, side effects, sleep, stay asleep, studies show, supplement, supplements, the menstrual cycle, treatment at home. I truly do trust all the ideas you could have announced in your post. These are very genuine and can absolutely do the job. Nonetheless, a threads are certainly easy for newbies. May just you want prolong these people somewhat from next time? Was looking for publish. Super excited to try Melatonin for my migraines, especially since most of mine are hormonal. I also take Butterbur at the first sign of getting a migraine..wks in minutes, with no side affects after. Bought at health food store, wks great!, will also try melatonin for prevention of migraines. I have been having migraines for about 30 years. I have tried just about everything including melatonin but not on a daily basis. I found a product that has melatonin, passion flower and a few other ingredients. I have been taking for little over a month. My migraines are gradually getting better which is awesome for me. I have daily headaches and this past week I have had 4 days of no headache at all. I say headache but am talking about migraine. bad migraine. I was using ambien to help me sleep when the pain was disrupting which was often. I am not using ambien anymore. I am still expecting to have migraines but I am feeling so much better. The product I am using has 3mg and I take at night , about an hour before bed. I sleep great and wake up with no headache, a miracle for me! Thank you for this article! After finding information about the possible application of melatonin for migraine prevention I talked to my headache specialist and we agreed to try it. I shortly went from having 15 or more migraine days per month to having 2-3 days per month. I have been using the melatonin for over a year and a half now. In the recent few months my migraines have begun increasing again, so it’s time to revisit the specialist to see if we need to change things up, but the past year and change was a relief. I had been to a specialist years ago that I stopped going to because I couldn’t afford it anymore as I had to take off work. We ended up trying a few different things that were ultimately unsuccessful. Imitrex does eventually help mist of the time but I get so tired and knocked out I can barely do anything but sleep. I went on birth control that I skip my cycle every month which helped with having cluster migraines during my period but ultimately I still was getting them. I was at about 10 to 15 days a month of migraines, about 70 percent of them were when waking up. I decided to try melatonin purely for sleeping benefits at the beginning of January. The other day I was washing my scrub pants and found a good amount of imitrex tablets in my pockets. I always carry one on me just in case and I always go through my alotted 9 tablets insurance allows me every 3 weeks. I was surprised to find the tablets and then it got me thinking, I haven’t had a migraine except maybe one or two since starting the melatonin. I was completely thrown off by this and eventually came here looking into this. If this truly works this will be a game changer for me ! Right after my 40th birthday I was informed by my family doctor after having some chest X-rays that I had mild emphysema. I had smoked for 20 years. I kept smoking and started getting sick about 7 months later. I ended up in intensive care for six days in septic shock from double pneumonia and almost died. The minute I start to walk around my breathing gets bad. Even the oxygen doesn’t seem to help. I want to feel good, and alive and energetic besides, I have a 2 years old grandson and I want to watch him grow up. My search for alternative treatments for treating my emphysema eventually led me to some amazing researcher/herbal doctor called Dr Linda(Best Health Herbal Centre) who had made unbelievable advancements in the use of alternative treatments to actually “Reverse” diseases. This same researcher/herbal doctor was providing her patients with herbal supplements that restored the immune system. I followed suit once again purchasing emphysema herbal supplement. After 6 weeks of relentlessly taking of the emphysema herbal supplements twice each day i completely recovered from emphysema! All my symptoms are gone and Remaining positive helped me during this treatment. My migraine frequency is much lower since I started taking melatonin, 9 years ago. Nice reading about the scientific proof about something I have suspected for long. Fibromyalgia pain can be frustrating. I had Fibromyalgia for at least 7 years. My initial symptoms were fatigue and lower back pain which were manageable, In 2015 it really kicked in with widespread pain, soreness, sleeplessness, inflammation and extreme fatigue. I tried so many medications and supplements to get some relief nothing worked, until last year, i learnt about FIBROMYALGIA SUCCESSFUL TREATMENT from Rich Herbs Foundation (RHF). I was skeptical it would help, but i gave the treatment a try. Few weeks into the treatment, I went back to work feeling good and my legs weren’t hurting, i almost forgot how long it has been since I felt this good and normal. The pain was 95 percent gone on my legs and lower back, the inflammation was gone too. Here I am 11 months after the treatment and i still feel good and active.